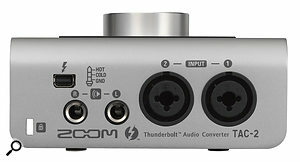 Is it better to buy an audio interface that connects to my computer by USB, Firewire, Thunderbolt or PCIe? Which will still be usable in five or 10 years’ time? And why aren’t there more USB 3 interfaces around? As our options for getting data from A to B increase — USB 3, Thunderbolt and Thunderbolt 2 have all recently been added to the mix, while PCIe, USB 1, USB 2 and Firewire 400 and 800 interfaces remain available — such questions are often asked by pro and home-studio users alike. In this article, I’ll try to tell you what you need to know when investing in an audio computer and/or audio interface. Before I dive into the details, it’s worth noting some good news: despite various generations of USB, Firewire and Thunderbolt all being employed in current products, backwards compatibility is included as part of the latest standards. Most Firewire 400 devices can operate on Firewire 800 connections. With an adaptor, many can connect to a Thunderbolt port too. Similarly, most USB 1 and 2 devices function quite happily when connected to a USB 3 port. That said, there are, unfortunately, a few exceptions. At the time of writing, USB 2 is the most common type of PC data connection in general use, but it’s clear that USB 3 will be similarly widely adopted, and many motherboards are now being released with more USB 3 sockets than USB 2 ones. Thankfully, USB 3 is designed to be backwards-compatible. In practice, that has worked well with most general-purpose peripherals, but some users of older USB audio interfaces have experienced unexpected problems when trying to connect via USB 3 ports. Similar teething issues were experienced with some USB 1 devices when USB 2 was first emerging and, just as we did back then, we’ve seen continued firmware and driver updates from the audio interface manufacturers — all of which means that such quirks are becoming fewer as time marches on. The USB 3 standard is certainly mature enough at this point that any new interface you purchase in future should already have any such problems ironed out. If you’re buying second-hand, though, it would be worth a quick Web search to check for known issues on the specific model in question. In the event that you do experience compatibility issues, though, it’s probably not the end of the world: current motherboards continue to include a small number of USB 2 headers, so you’ll have a stable fall-back option until any remaining teething issues are dealt with by the interface manufacturer. Is USB 2 Good Enough? Many users have expressed surprise at the relatively slow uptake of USB 3 by audio-interface manufacturers, and it’s only in recent months that we’ve started to see more than the first couple of USB 3 models brought to market. While USB 3 does offer some advantages, there are several good reasons for the apparently slow progress. First, there’s the issue of bandwidth, of which USB 2 offers plenty for most home-studio applications. The USB 2 specification states that it has the ability to transmit data at up to 480Mbps, but due to bus constraints, the way the data is handled, and designers leaving headroom to ensure the best possible results in day-to-day use, even a well-designed USB 2 interface is likely to have a throughput closer to 280Mbps. Let’s translate that into more practical audio terms. At the theoretical maximum USB 2 bandwidth, you’d be able to record just over 40 tracks of 24-bit, 96kHz audio, while halving the sample rate to 48kHz would give you 80 tracks. Staying at 24-bit/48kHz, consider a more realistic real-world USB 2 bandwidth of 240Mbps (a slightly conservative figure, giving us plenty of overhead to allow for the connection limitations discussed earlier): you’d still have the ability to work with up to 40 channels of broadcast-quality audio simultaneously! Yet there are some companies who squeeze far higher channel counts from their USB 2 audio interfaces by building their own USB controllers. These tend to be among the more costly options, due to the extra work and design choices that go into developing and optimising this sort of solution. By way of example, RME’s MADIFace USB is a USB 2 bus-powered 128-channel digital audio interface. This is made possible by the use of the MADI protocol for handling the data transmission, which is far more efficient than the native audio-over-USB standard. Many manufacturers of USB 2 interfaces also cater for higher sample rates, including 96, 192 and 384 kHz, but these eat into the USB bandwidth: every time you double the sample rate, you double the amount of data. To take that 240Mbps example I used earlier, you’d have around 35 simultaneous channels at 96kHz, about 17 at 192kHz and eight or nine at 384kHz. Manufacturers will tend either to offer fewer but higher quality (in terms of preamps, A-D and D-A conversion and so on) channels of I/O, or simply to restrict the number of I/O which may be used at certain sample rates. So, while it’s true to say the bandwidth of USB 2 does present limitations, it’s probably also fair to say that for most home-studio users these days they’re not all that limiting in practice. After all, how many of us can hear a difference between 96kHz and 192kHz recordings? The on-paper bandwidth of several different protocols appears similar, but in practice the bandwidth is more restricted than these figures show, particularly for variations on the USB protocol. Firewire and Thunderbolt require less ‘headroom’. According to the specifications, USB 3.0 can achieve an impressive 5Gbps but, just as with USB 2, this is reduced in real-world implementations. In practice, it tends to be closer to 3.2Gbps — over 10 times the bandwidth of USB 2. Manufacturers are beginning to take advantage of the better capability of USB 3. While there are not yet many USB 3-specific interfaces, the early trend is towards models with a higher I/O count, and support of more channels at the higher sample rates. This looks like being good news for those who either want to hook up lots of outboard or run large recording sessions, but who are unhappy with recording at 44.1 or 48 kHz — it should push the prices of such systems down in the long run. It might seem like early days for USB 3, but we’re already starting to see the newer USB 3.1 standard appear on computers — notably on some new Apple MacBook and Google Chromebook portable models, but also on some desktop PC motherboards. The ‘USB 3.1 Gen 1’ (‘Gen’ meaning generation) ports found on the laptops mentioned don’t offer greater speed/bandwidth than USB 3.0, but they provide greater standardisation of the feature set and improved efficiency. An even newer USB 3.1 Gen 2 is also emerging. This offers the features of Gen 1 but doubles the speed, increasing the theoretical throughput to 10Gbps, as well as improving data encoding to reduce the overheads. 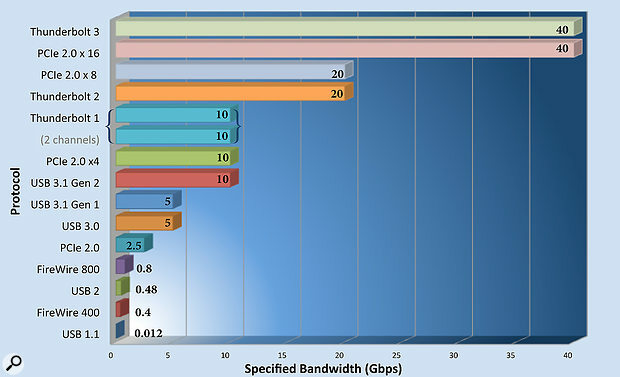 We can expect real-world connections to offer bandwidth in excess of 7Gbps, which is more than double that of USB 3.0 and 3.1 Gen 1. As before, there is a variety of physical connectors for the new standards, which can make things confusing. The Apple and Google systems mentioned earlier use the new USB Type-C connector, which features a smaller, reversible plug design. Just to confuse things further, Asus, who have 3.1 motherboards already available, and a number of manufacturers who will be updating their product ranges over the coming months, have adopted the higher–speed Gen 2 ports, whilst still keeping the classic single-orientation USB connector design. Another potential benefit of USB 3 (all generations) is that its ports can make more current available for bus-powered devices: 900mA, rather than the 500mA offered by USB 1 and USB 2. This should, in theory, allow manufacturers to develop better bus-powered interfaces, either with more facilities or more channels of the same. I say ‘in theory’ because most models haven’t yet taken full advantage of this extra power. However, some users may already be reaping the rewards in other ways: I’ve occasionally found that if a bus-powered interface wasn’t doing a great job of phantom-powering mics or driving headphones via the on-board amp, it has performed better when connected to a USB 3 port. Firewire (IEEE 1394) has never reached quite the same level of adoption on Windows PCs as on the Apple platform, and direct support on motherboards has tailed off almost completely in recent years, meaning that users of Firewire interfaces acquiring a new desktop machine have to fit a third-party card. When it comes to bandwidth, the first-generation Firewire 400 standard (IEEE 1394a) is slightly worse (400Mbps) on paper than USB 2, but in practice it holds several advantages. It benefits from a peer-to-peer connection system compared with USB’s more intensive master/slave approach, meaning that Firewire wastes less of its bandwidth and offers more stable throughput of data. As a result, it usually achieves lower latencies than USB equivalents, and Firewire interfaces have sometimes offered higher I/O counts than USB 2 devices. All these factors made Firewire the preferred connection standard in larger studios for a long time. The performance gap has decreased in recent years, though, and in some cases, high-end USB 3 interfaces have managed lower latencies than Firewire ones. The second generation of Firewire (Firewire 800, or IEEE 1394b) has also been around for a number of years now. It offers twice the bandwidth of FW400 so, as you might expect, most FW800 interfaces are high-I/O solutions, with the added benefit on some models that multiple interfaces can be daisy-chained for even more recording capability. It’s also a reason why there are fewer dedicated FW800 interfaces than FW400 ones: like USB 2, FW400 does more than enough for most home-studio users. Firewire 400 exceeded most users’ requirements and, as long as drivers are available for current operating systems, most Firewire audio interfaces can be run over Thunderbolt via an inexpensive adaptor — as manufacturers have been keen to point out! 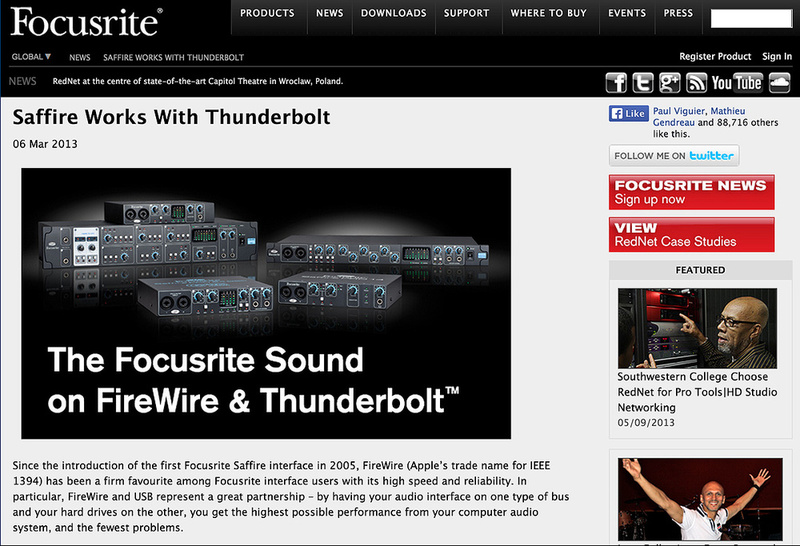 There’s been one major frustration over the years, though, particularly for PC users: because the Firewire standard requires more by way of two-way communication between the devices at each end of the connection (in this case, the computer and the audio interface), it means that there are more potential points of failure. Sometimes, when two controllers that haven’t been previously tested and validated by the manufacturer are combined, they may simply refuse to work together. Apple users have experienced less frustration, simply because they build a small number of standard models, using common components, and most manufacturers will have made the effort to test their interfaces with most Mac models. For this reason, many manufacturers keep FAQ pages on their web sites detailing pre-tested Firewire cards for each of their interface models. It’s well worth checking this list before buying. If your manufacturer doesn’t offer specific advice on the matter, it’s worth remembering that the most commonly recommended solutions are PCIe controller cards built around Texas Instruments controller chips (the presence of these is often indicated on the product box). Many manufacturers test their interfaces with these cards, and they’ve served in many a studio setup over the years. 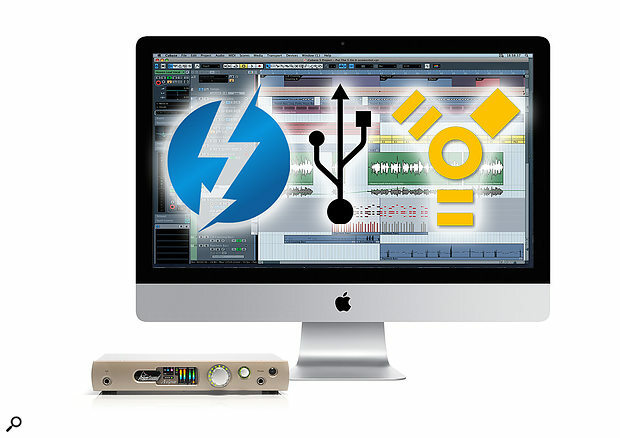 A more recent standard is Thunderbolt, which has already become well established on the Apple Mac platform, thanks to their early adoption. It has continued (slowly, to date) to make inroads with the Windows PC market — a number of motherboards now support it, either directly, with a port on the motherboard, or via an add-in card. While this sounds straightforward, though, the add-in cards currently have to be supported at BIOS level, and this normally requires a dedicated header to take the card; you cannot just add in a third-party Thunderbolt card in the same way you would a Firewire card. The slowness of manufacturers in bringing these cards to market is probably what’s stemmed the uptake of Thunderbolt among Windows users so far. While Thunderbolt capability can be added to some motherboards via a PCIe card such as this ASUS model, note that it’s not quite as straightforward as adding USB or Firewire ports in this way: usually, a dedicated header is required on the motherboard. In the last year, a newer Thunderbolt 2 standard has arrived — it was required to facilitate 4k video streaming and capture, among other high-bandwidth applications. It offers the same 20Gbps as Thunderbolt 1 but does so over a single channel, whereas Thunderbolt 1 delivered 10Gbps on each of two channels. Otherwise, it remains backwards-compatible with the original standard. The delay in uptake of Thunderbolt on Windows PCs means that most new PC boards are skipping Thunderbolt 1 and are starting to offer Thunderbolt 2. A key advantage of Thunderbolt for some of us is that it is protocol-compatible with Firewire, and it maintains a lot of the same feature set. This means that you can usually connect older Firewire devices to your computer Thunderbolt-equipped computer via a suitable adaptor which, given the number of Firewire interfaces still in use, is potentially great news — it might even breathe new life into older interfaces that you’ve abandoned when moving to a machine without Firewire ports! Whilst some early reports suggested that these Firewire-to-Thunderbolt converters were a little hit-and-miss, more recent testing and feedback shows that a lot of Firewire interfaces — even some of the more temperamental ones from previous generations — work without problem over Thunderbolt adaptors. If you’re considering working with Thunderbolt and wish to use your older interface with a new machine, it would be worthwhile researching other users’ experiences in manufacturer product-support forums. In this connection comparison, it would be remiss of me not to mention the classic option of an internal soundcard. PCIe-based soundcards have become rare in recent years, as many users have grown to appreciate the ability of being able to take their studio-grade recording interfaces out on the road and work remotely on laptop setups. The interface market reflects this. For many years, interfaces which connected to the computer via a host PCIe card, such as this RME model, were the only option for high-bandwidth, low-latency audio. While USB has improved in that respect, and Thunderbolt seems finally to be catching up with PCIe, there’s no good reason to abandon a PCIe-based audio interface as a matter of principle — they’re still capable of great performance. Yet, in a situation where more bandwidth is required, PCIe still rules the roost for data transfer rates, with some of the lowest recording latencies currently available. It’s still seen on some of the more specialist broadcast-industry cards for this reason, and it means that some older cards by the likes of RME and Lynx still offer fantastic performance. If you own one of these and are planning on updating a desktop machine, it might be worth finding one with a PCIe slot available. However, the format’s performance is being strongly challenged by the newer Thunderbolt standards and interfaces. For people buying right now, I’m afraid the market is in a state of flux as the various standards evolve. Indeed, shortly before going to press the first public noises were being made about the arrival of Thunderbolt 3, with the first official support due to arrive as part of Intel’s ‘Skylake’ chipset release, which is due towards the end of 2015. Thunderbolt 3 was announced by Intel shortly before we went to press, and while devices aren’t available yet, it promises vast bandwidth, plenty of bus power, and the ability to daisy-chain devices. But is it worth waiting for? 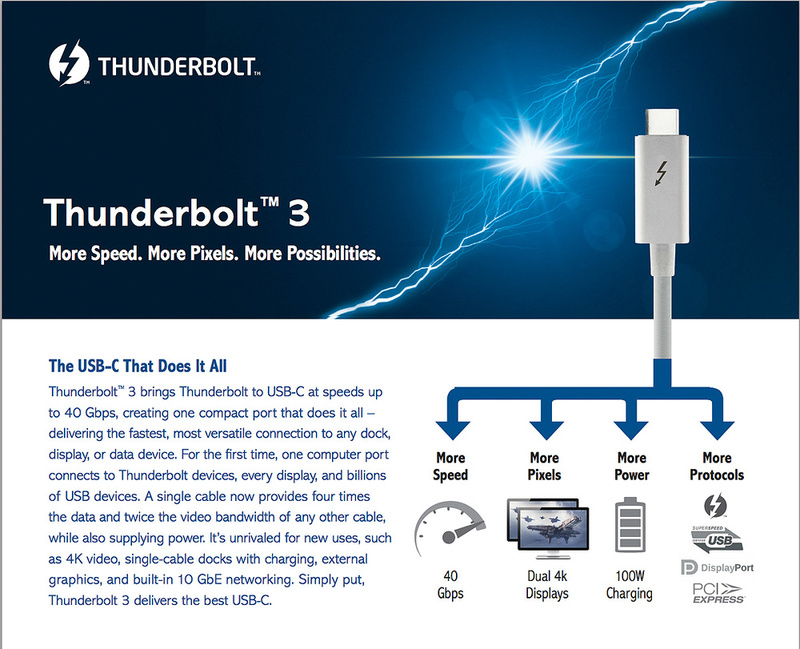 Thunderbolt 3 is being touted as the one cable to rule them all. The big headline figure is a 40Gbps data rate — that’s double the capabilities of Thunderbolt 2, and will continue to allow for the daisy-chaining of up to six devices where bandwidth allows. It will also support older Thunderbolt devices, and DVI, HDMI and VGA displays if connected via the appropriate adaptors. What’s interesting is the ability for Thunderbolt 3 to deliver up to 100W for connected device charging, as well as an increase in the available power delivered to bus-powered devices, up to 15W from the current 10W standard. This should, over time, bring a reduction in the number of connected devices requiring the dreaded ‘wall wart’. Just to confuse things, all this will be done via a cable designed around the same reversible connector standard as USB 3.1 — and the Thunderbolt 3 port will even be backwards-compatible with USB 3.1, although it will only offer the slower 10Gbps and lower charging rates employed by the USB standard when a 3.1 device is connected. 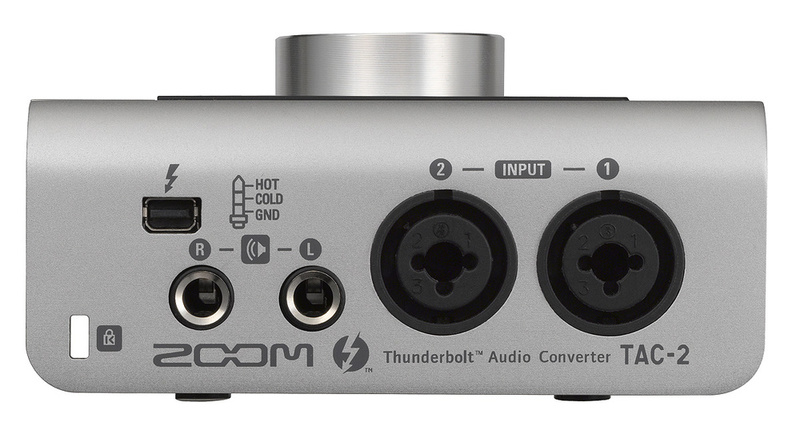 The small number of physical connectors on modern laptops means there is still a role for smaller Thunderbolt interfaces, such as the Zoom TAC2 pictured here, as they can often reliably be daisy-chained with other Thunderbolt devices. All that is in the future, though, and we’ll probably be well into 2016 before Thunderbolt 3-enabled computers and external devices start to become widely available. At the present time, USB remains the most widely supported standard, and it’s easy to use it to connect up an interface to most desktops and laptops. Any motherboard you buy today will feature both USB 2 and USB 3 ports and, between them, these are very likely to meet most of your needs, with 3.1 perhaps being an added bonus if you pick up one of the very latest motherboards. On the audio interface side, drivers and performance have come a long way in recent years. For many small recording-studio situations, as well as those working mostly in the box with few sounds sources to record, USB remains a good, reliable option. Thanks to its widespread adoption, the multitude of interfaces available also find themselves competing for market share, and this helps keep them keenly priced. Despite the increasing adoption of USB 3, don’t discount USB 2 interfaces: they offer more than many of us need and, currently, do so for less money than dedicated USB 3 devices. Those who need to add Firewire support to a desktop machine can do so easily via an inexpensive PCIe card. If you want a laptop, though, you’ll need it to be one with a Thunderbolt port and to invest in an adaptor, and while most Macs offer these ports, your options are going to be more limited with other brands. 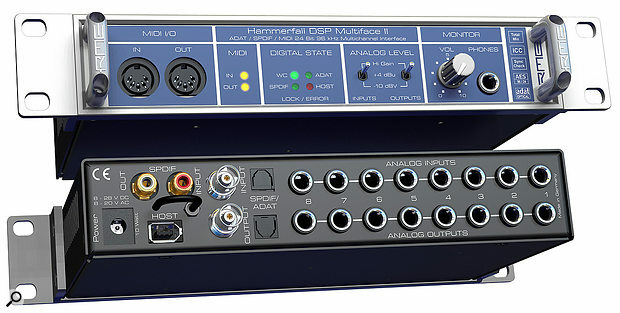 Some audio interfaces, like the newest Universal Audio Apollos, use the bandwidth and performance offered by Thunderbolt, as they host DSP plug-in processors as well as delivering audio to and from the computer. Finally, we come to Thunderbolt, which on the face of it holds the most promise for audio applications. 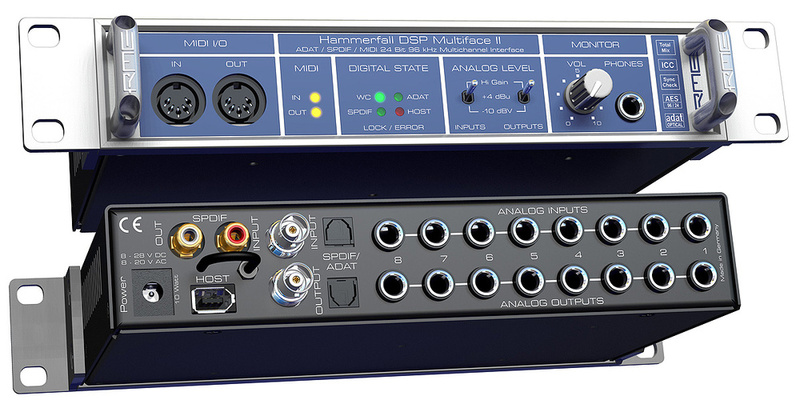 Several interfaces that offer large numbers of high-quality I/O — some with on-board DSP processing to boot — have been available for a while and more will follow. But we’re already seeing more affordable units too, including those with few I/O. Why? Well, Thunderbolt offers the same benefits as Firewire did. Not only does that mean good low-latency performance, but also the ability to daisy-chain devices. In practice, that didn’t always work so well with Firewire, but that was largely because of the more limited bandwidth. There’s much more available with Thunderbolt, which could make Thunderbolt audio devices appealing given the relatively limited connectivity offered by most modern laptops: not only does it mean you don’t need an adaptor, but it could also free up USB ports for external drives, iLok dongles and so on.